The Quay Grand Suites Sydney is close to everything that Sydney has to offer and features numerous guests facilities including lounge bar, child minding, conference centre, currency exchange services, direct internet access, disabled facilities, faxing facilities, guest laundry, gym & fitness equipment, lift, restaurant, room service, sauna, spa, outdoor swimming pool, tour desk, indoor pool, 24 hour reception, baby cots available, babysitting service and daily housekeeping. Enjoy the culinary delights at our restaurant - the Quadrant Restaurant - which boasts spectacular views to Circular Quay and Sydney Harbour and features contemporary Australian cuisine, with Mediterranean and Asian flavours. 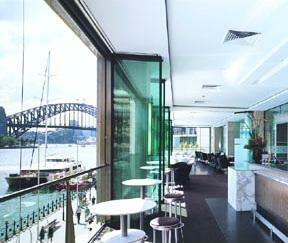 Alternatively, why not enjoy a drink at the ECQ Bar, located on the mezzanine level, providing guests with the city's most talked-about views of Sydney Harbour, the Bridge and Circular Quay. Exceptional Sydney accommodation to make your next visit to Sydney and enjoyable and memorable one. Nearby Attractions : Close to Sydney Opera House, Circular Quay, Sydney Harbour Bridge, Royal Botanic Gardens, Sydney shopping, The Rocks, dining and nightlife. 1 Bedroom Garden Suite : Sleeps up to 3 guests on 1 King Bed & Double Sofa Bed If Requested For Extra Guest. 1 Bedroom Harbour Suite : Sleeps up to 3 guests on 1 King Bed & Double Sofa Bed If Requested For Extra Guest. 1 Bedroom King Garden Suite : Sleeps up to 3 guests on 1 King Bed & Double Sofa Bed If Requested For Extra Guest. 1 Bedroom King Harbour Suite : Sleeps up to 3 guests on 1 King Bed.